This entry was posted on December 6, 2017 by Don Roberto. There are lots of private "couple" moments to pop the question. Going for a walk to see the lights or enjoy a snowfall, a romantic evening skate on an outdoor rink or perhaps after decorating the tree or going for lunch together. Making the choice to ask for her hand in front of the family should be carefully considered based on your relationships with the family on either side, and if there is anyone who might feel left out, with the proposal. There are many different styles, types, and designs in engagement rings to consider. Choose one that matches her personality and preferences and don't feel pressured to buy the hottest trend in engagement rings, unless those are the rings she has hinted would be her ideal choice. For the Classic – You can never go wrong with the classic engagement ring. This elegant princess cluster engagement ring is a romantic look for the ages. For the Glamorous – Filigree is a staple of the glamorous vintage style and is shown in all glory in this 1 ct. total weight white gold wedding set. For the Non Traditional – A beautiful 14k Rose Gold Vintage engagement ring will stand out from the crowd and highlight the uniqueness of your relationship. 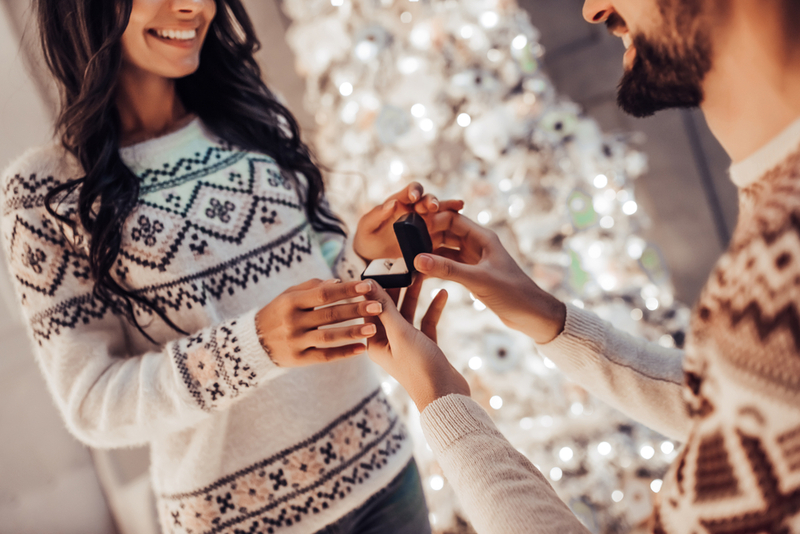 By planning ahead and taking advantage of one of a kind moment throughout the holiday season, you will find the perfect time, place and words to make your engagement truly special. Our fashion jewelry stores are available locally and for your online shopping needs.